With the start of a new school year in the United States, students and teachers welcome the hope and promise of a clean slate; it’s a time for resetting, taking risks and trying things differently. The start of school is an exciting time and I often use it as a reminder for focusing on professional goals for the upcoming year. Here are some of the goals I’ve set for myself this year. As an introvert, I find myself spending much more time listening to others talk, while at the same time, getting distracted by thinking about what I can contribute to a conversation and plan what to say next. I want to focus on listening for understanding and suspending judgment and evaluation. Mindful listening also means putting my other senses to work: being aware of non-verbal cues, body language, and tone of voice. To learn more about how being a good listener is crucial to being a great leader, check out this article. I love learning, whether it’s gaining a completely new skill or relearning/unlearning something so I can improve upon my performance the next time. Modeling this kind of learning becomes important for those students who may be used to more conventional modes of education. Learning today is different for Generation Alpha and occurs in various formats and diverse environments. Our rapidly changing world means the focus of learning shifts from content to capabilities, such as social and emotional intelligence, collaboration, critical thinking, and creativity. Developing these capabilities helps us evolve our skill sets to be successful global citizens. I make time every day to learn from my professional and personal networks and plan to attend at least three or four conference events during the school year. Implicit biases are attitudes and stereotypes we have without awareness or conscious direction. They can cause potentially devastating effects for classrooms and schools if we don’t realize their impact on others. I’m hoping that acknowledging my biases and moving toward them will improve my interactions with others and help me make better decisions. In my role, this could mean improvements in the hiring and interview process or provide a safer learning environment for students and colleagues. My job allows me to take a lot of risks and implement new ideas. I’m very lucky to have that support because it allows me to push myself and feel comfortable with being uncomfortable. I like to offer many different kinds of professional learning opportunities for teachers and district staff, including a Technologist-in-Residence Program, Learning Café, EdcampPDX and virtual office hours. Putting practices into place to help build and sustain my energy lets me accomplish more in less time at a higher level of engagement. I just learned about energy renewal programs; you adopt rituals that lead you toward healthy behaviors to sustain a positive attitude and mindset. I’ve identified these behaviors as important to me: exercising every day before or after work, five minutes of daily meditation, preparing more homemade meals, taking at least two 15-minute walking breaks during the workday and going to bed at a reasonable time. I’m optimistic that cultivating this good energy will widen my scope of positive human impact and keep me motivated and focused on my work with a renewed sense of purpose. What are some of your goals for the new school year and how do you plan to measure your progress toward them? Melissa Lim began her career in education as an elementary classroom teacher 20 years ago. She currently works as a learning, teaching and technology specialist for Portland Public Schools in Portland, Oregon, and has worked with the district for the past 18 years. Lim focuses on providing professional learning opportunities for district staff and teachers and supporting their education technology needs. 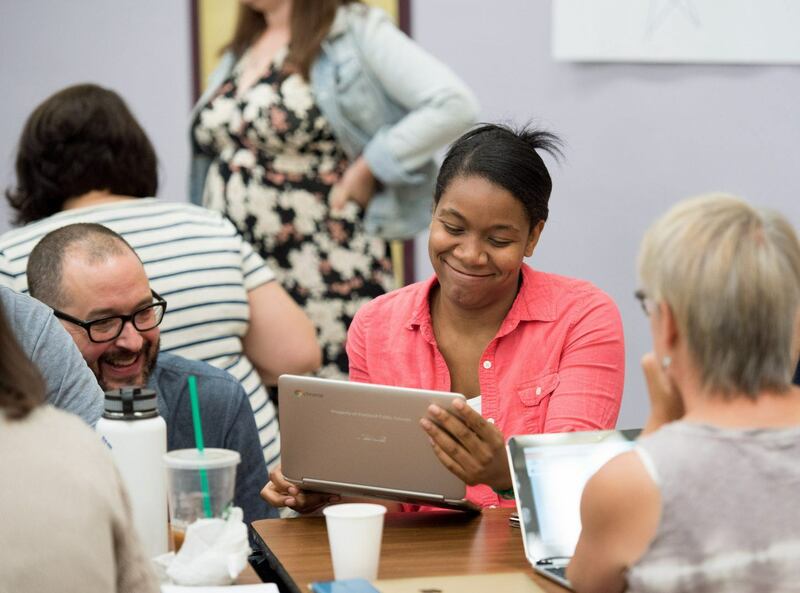 For Lim, the best aspect of her job is being able to connect locally and globally with teachers to share instructional best practices that integrate technology effectively. She is passionate about using technology to re-imagine education. She believes that today’s students and teachers have to be adaptive and flexible, working to understand personal learning processes in order to facilitate and navigate educational challenges in ways that are engaging, personalized, inspiring and relevant. Lim is a leader on the Oregon Edtech Professional Development Cadre. She is also an Intel Education Visionary, a Google Certified Trainer and an Apple Foundations Trainer. She is a co-organizer of EdcampPDX and has coordinated events such as EdTech Women Portland and the Rose City Make N Take.